The Main Valley in Nichols Arboretum has rightfully been called the “Heart of the Arb.” O. C. Simonds, the landscape architect who designed the Arb in 1906, foresaw how to develop this majestic verdant space and the iconic views of it. Simonds retained the undulating slopes just as the retreating glaciers left them more than 10,000 years ago. Now they are popular for visitors engaged in sunbathing, reading, picnicking, rolling down the hill, people watching, or simply enjoying the moment. The Nichols Arboretum Main Valley is the place for hanging out, reading, picnicking, studying, people watching, or simply enjoying the moment. 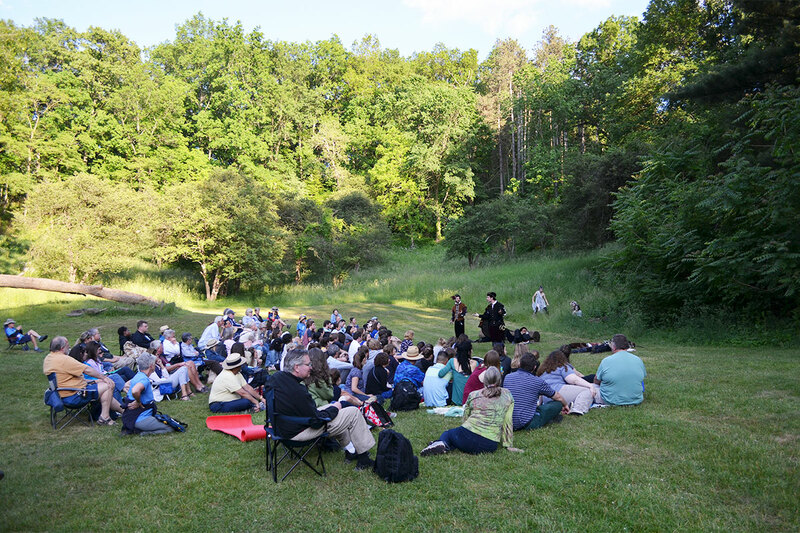 Here, a Shakespeare in the Arb performance takes place in one section of the valley. The tree collections surrounding the valley feature specimens from around the world as well as stands of native oaks, walnuts, and pines. The hardy Cedar of Lebanon (Cedrus libani var. stenocoma) is from Turkey and our Michigan conditions are near its climatic limit. A small stand is in a protected site near Maple Glen. The Japanese white pine (Pinus parviflora) has a commanding view of the central section of the valley, while the tall ginkgos (Ginkgo biloba) stand across the valley at the mouth of a seasonal rivulet. The specimen of the Chinese fringe tree (Chionanthus retusus) stands alone at the valley bend. This tree is considered one of the best in the country and is being repropagated for replanting. Invasive exotics are being removed, creating space to reestablish the original collections and the long-obscured viewpoints. On the east end, Maple Glen is being developed to showcase maples and their relatives from around the world. This collection was initiated in the early twentieth century but never completed. Near the bend in the valley, the original collection of birches and their relatives will be rebuilt around a core of North American species. Main Valley is at the Nichols Arboretum site.